Sights, sound, sail! 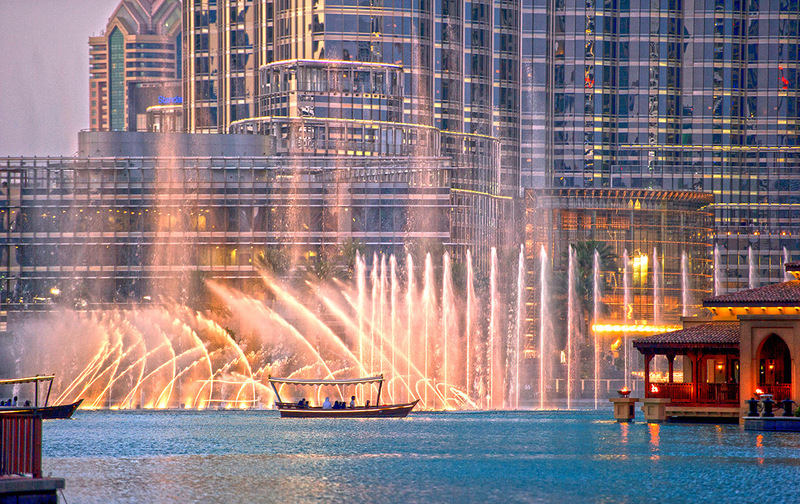 Set sail on a traditional Abra for an ultimate ride on the Burj Lake, home to the world’s largest performing fountain. The Dubai Fountain Lake Ride gives you front row seats to the best show in town. A captivating water, music and light spectacle in Downtown Dubai, The Dubai Fountain is the world’s tallest performing fountain. At over 900 ft in length – equivalent to over two football pitches – The Dubai Fountain is situated on the 30-acre Burj Lake and performs to a selection of different melodies. The fountain has a unique design comprising five circles of varying sizes and two arcs, and features powerful water nozzles that shoot water up to impressive heights. Over 6,600 WET Superlights and 25 colour projectors create a visual spectrum of over 1,000 different water expressions, while 50 colour projectors provide a full spectrum of colour with a total output of 1.5 million lumens. The fountain performs to a range of different songs from classical to contemporary Arabic and world music. When operational, the fountain has over 22,000 gallons of water in the air at any given moment.